The 67.5-kilometre road to the planned Eastmain River dam site, known as EM-1, is entering the third week of slashing of the right of way. Primary construction work on the road, beginning at Nemaska, is imminent. The road is scheduled for completion December 15. Cree Construction and Development Company Ltd. (CCDC), owned by the Cree Nation, is the primary contractor. After the road is completed the dam-construction camp will be erected, and a second 11-kilometre road to a second construction camp will be built. The Eastmain dams will receive water from the Rupert diversion, which has yet to go through an environmental assessment and receive final approvals. Hydro-Quebec plans to establish a series of concrete weirs "that will retain the dramatically reduced flow of the rivers to show a pretense of river in a few areas," says environment group Rupert Reverence. The weirs will be constructed downstream of the diversion as part of the environmental-damage mitigation procedures. Rupert Reverence says the weirs will disrupt river-flow variation, cause water stagnation and destroy spawning grounds of sturgeon and speckled trout. The river is an ancient trade route and heritage sites at rapids Plum Pudding, Smokey Hill and The Bear will be flooded by the weirs. La Presse, Quebec's largest daily paper, will be reporting by satellite phone on a Rupert Reverence-sponsored canoe descent of the Rupert River July 20-31. The story, written in French, will be found at www.cyberpresse.ca . The expedition will include well-known Quebec environmentalist Harvey Mead of Quebec Conservation Union (UQCN) and Chief Robert Weistche of the Cree Nation of Waskaganish. The group will begin the descent at Route du North — a highway between Chibougamau and Nemaska — that crosses the river downstream of the archipelago, and continue down to Waskaganish. Road construction between Nemaska and the EM-1 dam site will begin when forest fires in the area have been extinguished. The road is the first stage in dam and reservoir construction on the Eastmain River. The contract for the road has been let to Cree Construction and the company has finalized plans for slashing the right of way. Work crews would be busy now, but they have been held up by the fire. The 67.5-kilometre road was to be completed by the end of November, but the fire has pushed the completion into December. This road will support heavy equipment so it will be much higher-grade construction than a typical forest-access road. Once it is completed, the next stage will be the erection of the construction camp at EM-1. No work on the Rupert Diversion can begin before an environmental assessment. A list of Canada's most endangered rivers was released today and the Rupert River stood at the top of the list. The Kipawa River (near Lake Temiskaming in Quebec) tied with the Rupert for the top spot. The list was compiled by Earthwild International, TD/Friends of Environment Foundation and Mountain Equipment Co-op. A 67-kilometre road between Nemaska and the EM-1 dam site, to be located north of the village, will be constructed by October. This will be the first time construction equipment will be on the move. According to Don McLeod of the Cree Regional Authority, which is responsible for letting the road contract to a Cree company, the road will allow equipment to be moved to the dam site and allow a construction camp to be built there, possibly late this year. These activities are part of the Eastmain project, not the Rupert Diversion. As a separate project, the Rupert Diversion is still subject to an environmental assessment and construction may be two years away. Grand Council of the Crees has established a joint Cree-Quebec Mineral Exploration Board to bring the Cree into the development of mines in Cree territory. The board creation is part of the February Rupert Deal. Rupert Reverence has called on Quebec to create parks around the Rupert, Eastmain, Némiscau, Misticawissich and Lemare rivers. Reverence's request comes ahead of Environment Minister André Boisclair's announcement of the Quebec Protected Areas Strategy, a plan to expand Quebec's parks by 2005. The global standard for protected areas is 12 per cent of the landscape, but Quebec remains one of the least protected provinces in Canada. "The government says they have protected 2.8 per cent, but only half a per cent is fully protected," says Brigitte Voss of Canadian Parks and Wilderness Society (CPAWS). With this new process Quebec says it intends to expand protection to eight per cent. The Némiscau, Misticawissich and Lemare rivers lie between the Eastmain and Rupert and drain south into the Rupert. They will be severed and diverted north by the Rupert diversion. Rupert Reverence is reborn as a coalition of Crees and northern Québécois. The environment group, which opposes the Rupert River diversion, added five First Nation people to its board and appointed Lisa Petagumskum of Chisasibi as co-president. Petagumskum fought the Great Whale Project in the 1990s and has been an outspoken critic of the Cree-Quebec Agreement. Other aboriginal representatives come from Mistissini, Waskaganish, Whapmagoostui and Nemaska. The remaining board members are from Chibougamau and Rouyn. Board membership numbers 11. Founder and co-president Éric Gagnon worked tirelessly toward this new union that adds to Reverence's authority and legitimacy. As with many environmental conflicts, there are homegrown issues that muddy the waters. Quebec resents outside interference. Northerners resent southern interference. And everyone is sensitive to criticism of First People. Rupert Reverence in its new incarnation has largely overcome these side issues and gained new potency. 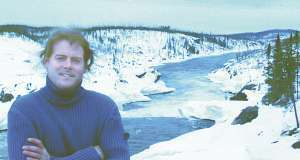 Éric Gagnon at Rupert River downstream of the proposed diversion point. Most of the river will be gone here after a diversion. On Tuesday, Quebec offered a $475-million deal to the Inuit of northern Quebec that would grant Quebec the right to study hydro-electric development on Inuit lands. Currently, there are no roads or dams on Inuit territory. This and the Rupert deal mark a departure for Quebec. In 1975, Quebec signed a deal with the Inuit and Cree only after it had begun the James Bay Project. Now, mirroring the Rupert deal signed with the Cree in February, Quebec gets consent in advance of hydro-electric development. The Inuit will receive the money over 25 years. The deal is subject to a referendum to be held in the 14 communities where 9,600 Inuit reside and is scheduled over the next month. Inuit territory, known as Nunavik, lies just north of Cree territory and covers 500,000 square kilometres. "In the past, when we signed agreements, we were always dictated to," said Inuit leader Pita Aatami in a Canadian Press story. "Now we're dictating together." A side agreement protects the water levels of the Rupert River's archipelago, which is just upstream of the diversion point. The agreement also gives the Crees the option of setting the minimum flow of the river, through the diversion point, at 20 per cent of its current flow. The Crees have to make this request by April 1, 2003. This side agreement, called the Boumhounan Agreement, was signed by the Crees and Hydro-Quebec at the time of the main agreement signing on February 7.